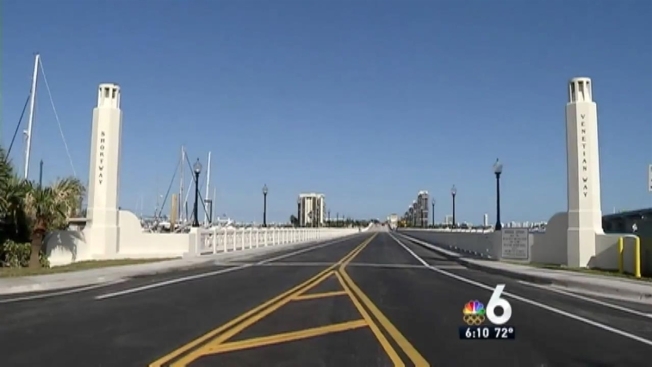 After nearly nine months of renovations, the historic Venetian Causeway reopened Monday, just not quite in time for the early morning rush hour. The causeway reopened at noon Monday after a $12.4 million renovation project that kept it closed for the past nine months. "The bridge was in decrepit condition. The repairs will add 60 years to the life of the bridge," said Miami-Dade Mayor Carlos Jimenez. In 2014, a hole opened up on the 90-year-old structure. Miami-Dade County declared the repairs an emergency. Officials said 730 feet of weakened bridge closest to Miami that were patched together by metal plates would be replaced. After a $12 million renovation project which closed it for the past nine months, the Venetian Causeway reopened Monday afternoon. Aside from the new section of the bridge, drivers will also notice a new approach roadway and new lighting in the area. A ribbon cutting ceremony took place just prior to the reopening. Built in 1927, the Venetian Causeway is considered both a local and federal historic landmark. In 1989, the federal government listed the causeway on the National Register of Historic Places. "You can't really run any place else in Miami with water on both sides of you. There's a bike path and running path. You see friends around here all the time, running and riding. It's a community. It brings people together," said Cristina Ramirez, Venetian resident.